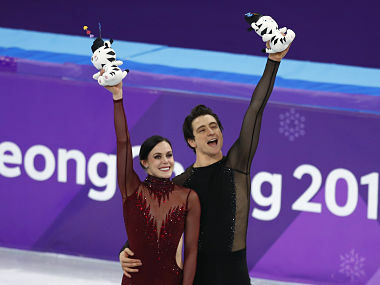 Gangneung: Canada's Tessa Virtue and Scott Moir conjured up a magical record-breaking performance to win Olympic ice dance gold on Tuesday. 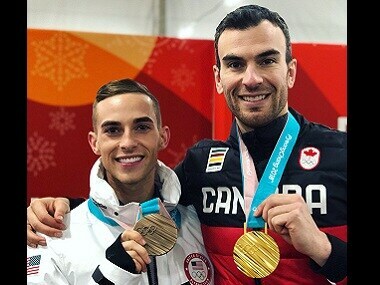 The Vancouver 2010 champions looked destined for silver after French rivals Gabriella Papadakis and Guillaume Cizeron appeared to have stolen the show, breaking their own free dance and combined score mark. But skating last, Virtue and Moir pulled out the dance of their lives under incredible pressure to earn 122.40 for a combined total of 206.07 points, narrowly bettering the French duo's 205.28. "Amazing. It was a special moment to come out last," said Virtue. "It was a strong last group, there was a lot of pressure, but I'm so happy with how we performed." In bronze, almost 13 points behind, came American brother and sister Maia and Alex Shibutani. For Virtue, 28 and Moir, 30 this was a fifth medal to go with their Vancouver gold and silvers they won in the team and ice dance at Sochi, and gold in last week's team event in Pyeongchang. That made the popular Canadians the most decorated figure skaters of all time. 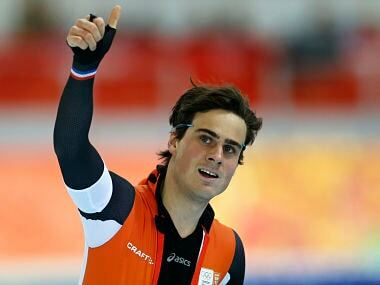 They had led after Monday's short programme, in which Papadakis suffered an embarrassing wardrobe malfunction. Wearing a backless all in one number this time with no annoying clips to become unfastened she and her partner could not have done any more in their bid to become only France's second ever champions in this discipline likened to ballroom dancing on ice. They have been superb all season, becoming the first ice dancers to break the 200 point mark last year. Their elegant and seamless routine to Beethoven's Piano and Moonlight sonatas earned a row of level fours from the judges. Papadakis fell into Cizeron's arms crying, before the couple exited to the wings of the Gangneung Arena to see if their training companions in Montreal could deny them the title. The Canadian couple began their routine to Roxanne from Moulin Rouge with many at the venue believing they were tilting at windmills. But their energetic and sensual tango stole the rink jury's hearts, and broke those of their two French friends' watching their dream of Olympic glory disappear.